Among the Adirondack Mountains in the state of New York, there is Lake Placid. The namesake of the Fenders guitars “Lake Placid Blue” guitars stretch at 2,170 acres and reaches 50 feet in depth. The lake and the village named after it are known as popular destinations during the winter. But before Lake Placid became a winter resort, the area’s extended winter posed a problem for its first settlers. Before the pioneers, the area of Lake Placid was the settlement for the Iroquois and Mohawk Indians. Historians believed that they resided in the area during the summer, but went further south during winter. Elijah Bennet and his wife, Rebecca, were the first white settlers of the area in 1800. They arrived at the place from Vermont after the Revolutionary War. Bennet served in the war and injured his left arm, leaving him handicapped. He, his wife, and their seven children resided on the land which is now currently the upper golf course of the Lake Placid Club. Golf course lovers would now go to this place to enjoy their favorite sport. https://www.carvedlakeart.com/san-diego-wood-nautical-chart-map-p/sdgo-d3l.htm Check out carvedlakeart if you want the best deals on wood nautical chart, wooden map, lake art in Lake Placid, and charts of the lakes, streams and oceans of the world. The year was ridden with blizzards all year round. The crops died due to the harsh weather and the residents were threatened with starvation. Farmers decided to move farther to the west, leaving only ten families to remain in the area. One of the families who remained were the Osgood family. Squire Osgood took the opportunity and took the abandoned fields left behind by the families who moved away. Eventually, they established the first tavern and inn of the place. During the late 1800s, population around Lake Placid bloomed again. In 1895, Melvil Dewey, the inventor of the Dewey Decimal System, designed the Placid Park Club. this became the inspiration of the villagers, who later adopted the name Lake Placid. The village known as Lake Placid was incorporated in the 1900s. The Placid Park Club was later called as Lake Placid Club. The social and recreation club drew in the interest of the rich and famous. During the 1900s, more people saw the area’s potential for winter activities. In 1929, Dr. Godfrey Dewey, son of Melvil Dewey, talked to the International Olympic Committee (IOC). He presented that Lake Placid had the best winter sports facilities in the United States. 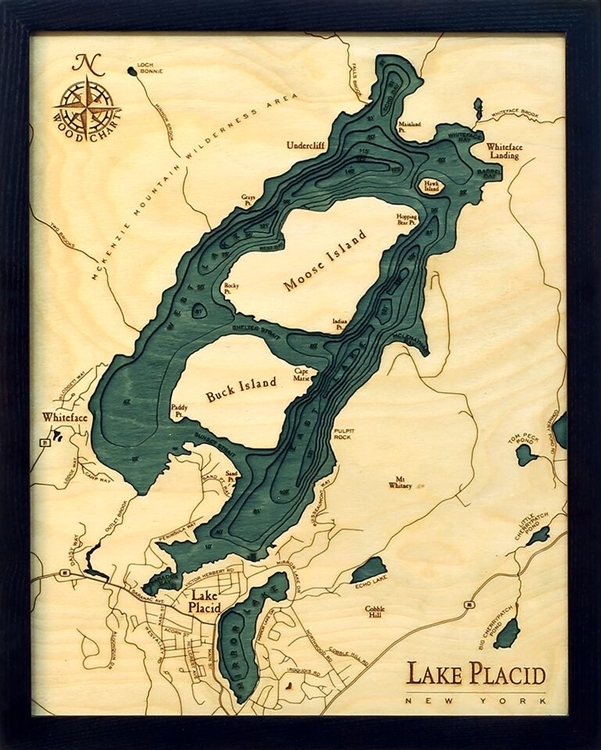 https://www.carvedlakeart.com/san-diego-wood-nautical-chart-map-p/sdgo-d3l.htm Check out carvedlakeart if you want the best deals on wood nautical chart, wooden map in Lake Placid, and charts of the lakes, streams and oceans of the world. In 1932 and 1980, the Lake Placid Club became the headquarters for the IOC during the Winter Olympics. Lake Placid itself became the site of both Winter Olympics and Olympic athletes and gold medal winners for the said event experienced their success in this location. Today, the lake houses Buck Island, Moose Island, and Hawk Island. It is the source of drinking water of the village of Lake Placid. The lake gets its water from the springs and the streams from the Adirondacks mountain. Its shores have nearly 300 houses, but most of the houses are unoccupied for most of the year. Due to this, the lake’s water remains clean. Winter sporting is now one of the great things to do here in Lake Placid. Being an Olympic center in the past, hosting gold medal winners and other Olympic athletes made it a great place to add to your vacation events calendar.